Moneyslane FC were delighted last week as their appeal was upheld by the IFA. The Mid-Ulster Football League had ruled that theirgame against Laurelvale would have to be replayed and Ritchie Nesbitt was to be banned for six games. However, the IFA overturned that decision. “We are delighted to confirm that the IFA Appeals Board have unanimously upheld the appeal over Richard Nesbitt’s registration,” said a club statement. 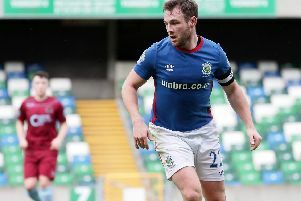 “The IFA verdict ruled that the MUFL Player Registration Secretary Stephen Magill had made an administration error by incorrectly advising the club to sign Nesbitt on a registration form instead of a transfer form. “The IFA Appeals board ruled that it wasn’t fair or just to punish the club or player for simply following a direct written instruction. “Club Secretary Ian Johnstone and 1st team Manager David Johnstone attended our IFA HQ in Windsor Avenue for the lengthy hearing. “They presented our club’s case and the members of our IFA appeal panel fully accepted the points they made. “Moneyslane FC and Richard Nesbitt have been totally vindicated and cleared of any wrong doing. The 9-2 league result against Laurelvale FC stands and Richard Nesbitt is free to play.